as conceived by architect Rios Clementi Hale Studios. Al Capone spent a night there. So did many of those arrested during the 1943 Zoot Suit riots, in which servicemen targeted young Mexican Americans; gay people were locked up there in a purpose-built wing -- also, drunks and people caught up in the Watts Riots of 1965. We are talking about Lincoln Heights Jail on North Avenue 19, the five-story, Art Deco-style jail opened in 1931 on the LA riverfront, closed in the mid-60s and now set to be adapted into a mixed use development by a team that hopes to turn it into a welcome destination for the Lincoln Heights community rather than a bleak memorial to darker times. The jail was designed in the 1920s to accommodate 625 prisoners. By the early 1950s, it was known to hold up to 2,800 prisoners, giving rise to the term "Gray Bar Motel," now slang for jail. As a result of overcrowding, the City of Los Angeles approved an expansion in 1951 and the jail housed prisoners until the late 1950s. It was finally decommissioned in 1965, when the Los Angeles City Council and the County Board of Supervisors determined that it would be more cost effective to close the prison and place inmates in the nearby county jail. Lincoln Heights Jail has long been considered gloomy and maybe even haunted, and its sense of isolation is increased by the fact that it's surrounded on all sides by infrastructure -- the LA River, the 101 and the Arroyo Seco on the other side, and the Gold Line. In 1993 there was an effort to tear it down to make room for a light-rail line between downtown, Glendale and Burbank but preservationists fought back and it received official historic-cultural monument status that year. From 1979 to 2014, the building housed the Bilingual Foundation for the Arts. It has also been used for sports tournaments and as a filming location -- you'll see it in a Lady Gaga video, Con Air, LA Confidential, Chicago Hope and a Hootie & the Blowfish music video. But for decades the city has been hoping to give it a new permanent use and proposals over the years have included a state prison, trade technical high school and an urban rooftop garden. In March a year ago, the city issued a Request for Interest for those considering reusing and repurposing the Lincoln Heights Jail. 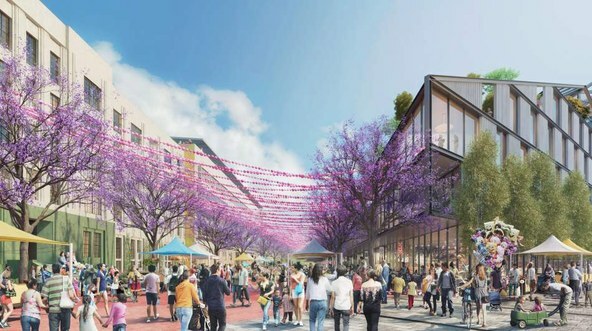 Now a team led by Rios Clementi Hale Studios (RCH Studios) and developers Lincoln Property Company and Fifteen Group has been recommended by the Los Angeles Chief Legislative Analyst to redevelop the site. LA City Council is due to vote next week on approving the team, which beat out two others. The proposals were assessed by community members and City staff who recommended the Rios Clementi Hale/Lincoln Property/Fifteen Group team. Rios Clementi Hale Studios have a strong track record in adaptive reuse in the LA River/downtown LA area. 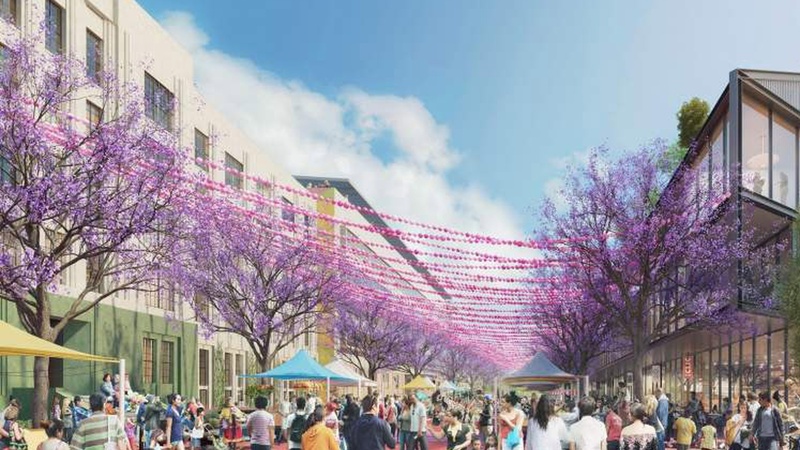 Their projects in the area include the California Endowment near Union Station and the new retail destination Row DTLA. They also designed Grand Park. The team recommends combining the jail parcel of five acres with a 3.2 acre property next door that is already owned by the Fifteen Group -- this was the site used for the recent 14th Factory art installation that attracted huge crowds -- making a much larger parcel in which they can incorporate commercial and residential uses into the buildings and create a lot of open space to serve the local community. They plan to make a feature out of their river frontage and propose new bicycle paths and landscaping to connect and improve the surrounding blocks. While everything is open to change based on extensive community outreach, they currently suggest around 270,000 square feet of residential spaces, 200,000 square feet of commercial uses, and 57,000 square feet of designated manufacturing and retail spaces. The project is slated to contain affordable housing and an area for a community of makers. The architects want to keep the historic buildings and tear down any other buildings, maximizing open space and the merits of the old jail buildings. Renderings show former cells repurposed as gritty but light and airy lofts. A challenge is the island-like site. To try and remedy this, Motonaga says the firm “looked at it as public open space and then introduced pedestrian loop paths that went through the entire eight acres and created a way to experience the district as a whole, flanking the LA River on one end and then wrapping up into the other parcel across the street, as a means to provide different kinds of vehicular access and also allow for maybe a festival plaza to be put into Avenue 19." In addition the team, proposed a large, communal roof deck that would be accessible to the public and offer “a viewing point to see the neighborhood from the river... the occupation of the roof by the public as opposed to it purely being private was a big move for us where we wanted to extend the landscape up. So we called that 'the great escape' because we put in a new stair tower on the side of the building that could provide access all the time." DnA asked Motonaga if the project might include some kind of memorial or museum that would acknowledge the building's past use. “I think that is definitely possible,” he responds. “We really wanted to engage the public on how they wanted to remember or integrate the past into the project because it does touch a lot of people in different ways. There are a lot of longtime residents in the neighborhood that remember the jail as a jail, and all of the things that happened there, so we believe that discourse has to happen and that there are many opportunities. We also have been in discussions with the Bilingual Foundation for the Arts to actually come back to the project as well and provide some sort of theater for them or something where they could once again bring back their community-based arts program to the site." As for who pays for the development, as in, would this be a public-private partnership of some sort, Motonaga says that will be determined as “part of the upcoming negotiations once the team is selected. In the proposal you had to produce concepts as well as your financing plan and all of the proposed programs."